To learn the obstacles we would have to surmount was to take the first step toward success. My preliminary experiments made with inexpensive apparatus and equipment of small size had fully convinced me that an electric gun, when operated with high-frequency currents so used as to produce travelling magnetic waves, is a tool of versatile applications and enormous possibilities. I early foresaw that an electric gun of any length and any diameter could be constructed, so that, when suitably powered with electric energy, it would shoot streamlined projectiles with tremendous velocity and range. We considered that even if we should fail in attaining our ultimate goal of freeing ourselves from the pull of earth’s gravity and navigating in space we could nevertheless make a notable contribution to technology if we perfected and demonstrated the potentialities of a device in which the limitless driving energy of electricity, substituted for explosives, would in many cases do all that explosives can do, and much more. This figure illustrates how an electric gun, small or large, has a magnetic field sweeping like a wind along its axis. This magnetic field, travelling at high velocity, picks up and propels in the direction of its motion any metallic or conducting material. In the case illustrated, the iron tongs, when placed in the lower end of the energized gun, were shot upwards with high velocity to a considerable height. 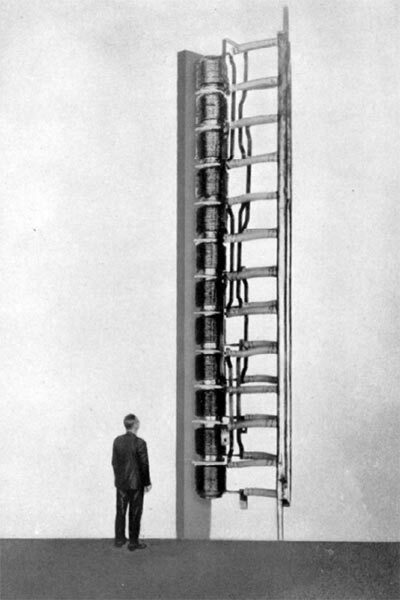 The height to which they went varied with the amount of three-phase currents applied to the gun, the frequency of these currents, and other factors. Cylinders of conducting non-magnetic material are propelled upward in like manner. This gun is actually only four inches in diameter. It was so photographed with a man standing near as to appear much larger. We did this the better to visualize a rather large gun. We used this experimental gun to learn what classes of materials it would propel. When energized with currents of 4800 cycles it propelled at high velocity such diverse materials as solid cylinders of Acheson graphite, brass, aluminum, and steel. Iron scraps of all kinds, which were not too small, such as pliers, screwdrivers, bolts, nuts, etc., were carried forward at high speed by the rapidly travelling magnetic field. The usefulness of the electric method to replace pneumatic transportation of materials is here seen. For example, a nonconductive material such as wheat or oats, when placed in tin containers, might readily be lifted to the top of grain elevators. The high-speed travelling magnetic wave is thus seen to useful for a variety of commercial applications. I reproduce here a photograph of a very early experimental gun designed to shoot four-inch diameter projectiles with moderate velocities. 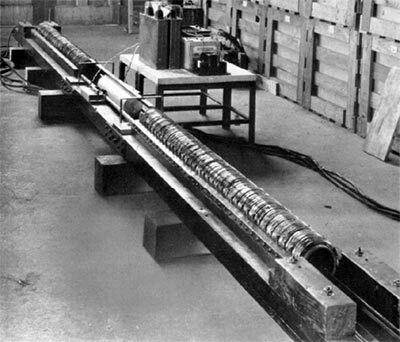 It will be seen from this photograph that an electric gun consists essentially of a series of coils of copper tubing wound in a single layer. These coils are joined in series in a special way to be explained later. At the instant of shooting a projectile they are energized with a current having a frequency twenty to one hundred times the frequency of sixty cycles generally used before the middle of the century for the production of light and power. The current, to be effective for producing motion, must be what is very generally known as two-phase or three-phase current. The hollow aluminum projectile (standing vertical) is designed to carry a large charge of explosive to a moderate distance. 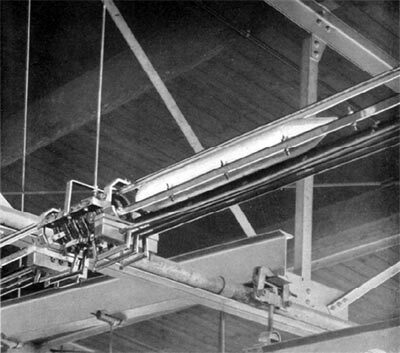 This gun, when energized with three-phase sixty-cycle current, produced a thrust on the four-inch diameter cylinder as high as seven hundred pounds. To obtain a high muzzle velocity the gun must be energized with high-frequency currents (one thousand to ten thousand cycles) and the projectile must be specially designed for the frequency of the current used. 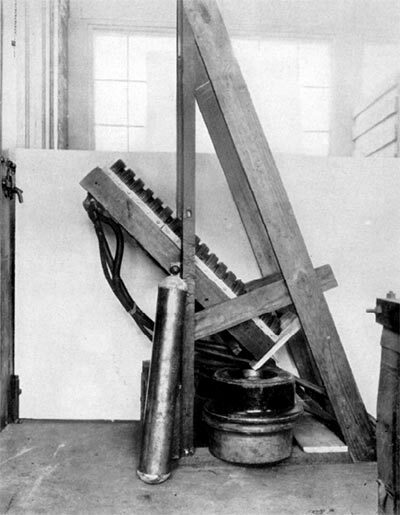 This horizontally placed pair of gun coils were constructed to determine the acceleration which different types of projectiles would acquire. The near end set of gun coils accelerates a short projectile while it is moving through the coils. The muzzle velocity attained is easily measured while the projectile is moving in the space which separates the near and far sets of coils. When the projectile enters the far set of coils it is deaccelerated (slowed down) because the electrical connections of the far set of coils are so made that the coils tend to move the projectile in a direction oppostie to the direction in which the near set of coils moves it. By this device the performance of any type of electric gun can be studied without actually shooting projectiles either to a distance or into a sand bank. 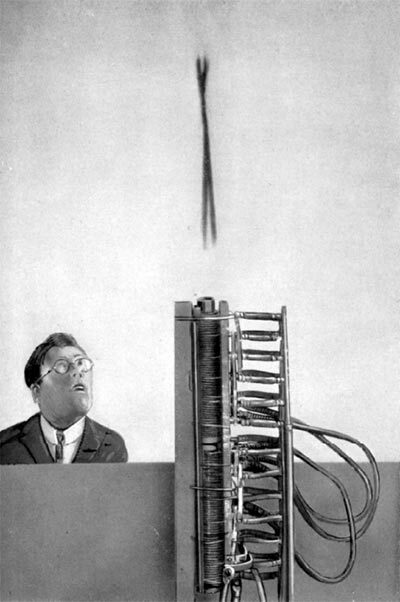 The illustration shows a short section of an experimental travelling wave transmission system. Sets of coils similar to the one shown in the photograph were constructed and placed twenty to fifty feet apart. The carrier cylinder, hollow and streamlined, moves at very great speed in its guides. It receives a new impulse as it passes through each coil. Only one coil is energized at a time, and only so long as the carrier is entering, in, and leaving it. That is, the power is automatically shifted along as the projectile advances. Reversal of two lead conductors reverses the direction in which the carrier moves. When the carrier enters the last coil of the transmission system it is brought to rest in this last coil, which is connected in a manner to slow the motion down. In other words, the rapidly moving carrier is stopped by a magnetic cushion.